It’s my pleasure to introduce you all to Sharon Yesner today. Since our founding in 2009, many individuals and senior center staff have requested us for training to start groups in their cities, but she has always stood out to me because of her personal story about her grandmother, her passion for seniors and her commitment to our program. It was a no-brainer whom I had to call when we needed a perfect person to kick of our national expansion… Sharon!! I am thrilled to share that we have selected her venue, Pitman Manor, New Jersey, as the first site to receive an exclusive copy of our brand new Facilitator Training Guide! I, like Benita, had the opportunity to hear my grandmother’s stories. However, unlike Benita, my grandmother shared her stories with me when I was still in elementary school. Though that was years ago, I can still remember her sharing the stories like it was yesterday. On my office desk, I have a picture of me and my grandmother. I usually reference her a number of times a month when I speak to my volunteers. 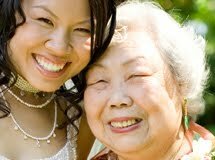 Her stories impacted me and my mom, who was her daughter-in-law; i.e.- My grandmother shared with us that she never felt like a child since she assisted her mom in raising her 5 younger sisters. She said she never had a doll when she was a child. In response to that my mother bought my grandmother a baby doll that was always kept on her sofa in her apartment. 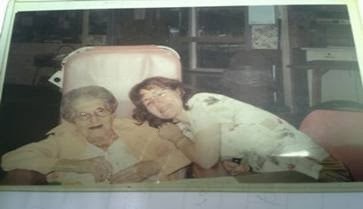 When my grandmother moved in to a nursing home at age 96, the doll went with her. When my grandmother passed away in 2005, I got the doll and I still have it today! After my grandmother’s death, I learned she hadn’t shared those stories with my cousins. I am so glad she shared her stories with me! When I first read about The Best Day of My Life So Far’s Seniors’ Storytelling Day at the Free Library of Philadelphia (Nov. 2010), I was intrigued. I went to the blog and read more about the program. Through shared contacts, I got in touch with Benita and her team. In the spring of 2011, I was invited to their Launch Party at the Free Library for a summer expansion of the program. I attended the event with a co-worker who also was interested in Best Day So Far’s program. We loved the launch event and the opportunity to learn more about Best Day So Far firsthand from the program’s participants. One pair of stories in particular really made an impact on us. They were about Vision! First we met Joe and heard his stories about being blind. Next, we heard from Olivia, a teen who attended the session where Joe first shared his story. Olivia’s reflections on the story and the impact it made on her were amazing. It made us even more inspired to get involved! I share their stories whenever I tell someone about the Best Day So Far’s program! Earlier this year, I was honored when Benita invited me to be part of the review team for their new Training Guide as they prepared for a national expansion of the program, and again, when Benita asked me if Pitman Manor would be interested in being the site for the first satellite group of the Best Day of My Life(So Far)'s national expansion. Pitman Manor is a senior continuing care community located in South Jersey owned and managed by the United Methodist Homes of NJ. The Homes are in their second century of serving seniors and are currently in the process of launching a Vibrant Living Program for our residents. Starting the Best Day So Far program at Pitman Manor in February 2014 for our residents is a perfect addition for such a program. It can increase our residents' communication and creativity with each other and our staff! We will also be networking with our South Jersey neighbors. Students from Rowan University will be the facilitators for the Best Day So Far Program. Our residents range in age from 65-107 years of age with approximately seven residents over the age of 100. The oldest resident has lived in Pitman all her life, is only a year younger than the town and still plays bingo weekly! We have residents who are veterans, retired teachers and nurses and so much more! The young woman whom I have invited to be our group's facilitator has been an intern at the Manor since October, writing for her class and helping our staff with press releases. The one thing she always wants to share with her readers is the knowledge she is gaining from the residents she interviews. Now by being a Best Day of My Life So Far site, we will be able to have more residents share their knowledge and wisdom with others through the stories they will tell by participating in this great program!